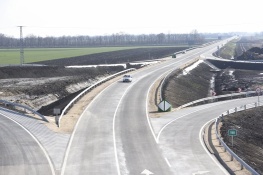 With Colas Út, Colas Közlekedésépítő and Colas Hungária all among the major contributors, the 13-kilometre-long Hódmezővásárhely bypass section of main road 47 has been finished in a record-short 18 months. The road was handed over to the traffic on 22 March. More than 30 beams were installed in 10 hours on the bridge of motorway M35 above main road 4 at night on 12 May.